President Duterte meets with officials of the Metropolitan Waterworks and Sewerage System, led by chairman Franklin Demonteverde, at Malacañang the other night. MANILA, Philippines — An outraged President Duterte has threatened to fire the government’s water regulators and terminate the concession agreements with two private companies for failure to provide sufficient water supply to millions of Metro Manila residents. 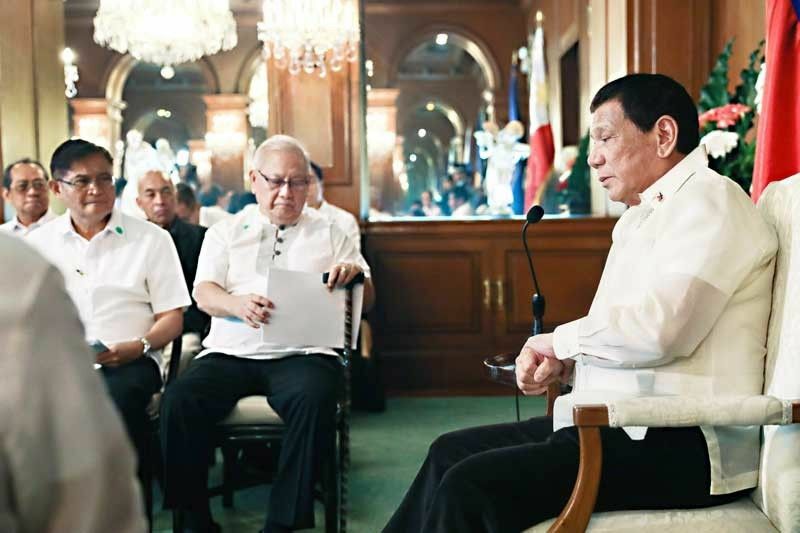 Duterte gave water regulators, including the Metropolitan Waterworks and Sewerage System (MWSS), together with the top officials of Manila Water and Maynilad a dressing down during their meeting at Malacañang Tuesday night, presidential spokesman Salvador Panelo said yesterday. “In a stern message delivered without even once looking at the officials, the obviously outraged President threatened to fire the MWSS officials and terminate the concessionaires’ contracts,” Panelo said. MWSS chairman Franklin Demonteverde and administrator Reynaldo Velasco were among those present during the meeting with the President. Duterte also ordered all concerned officials to submit a report on the water shortage before April 7 or face relief from office or the termination of contracts of the concessionaire. The presidential monologue lasted 40 minutes, Panelo said, as he berated the top officials and told them to “shape up or ship out” for failure to address the lack of water supply in the past two weeks. “The meeting was abruptly ended with the President ordering the officials to submit a report on the water shortage before April 7, after which he will decide whether heads will roll or the contracts of the concessionaires will be terminated,” Panelo said. “He said the officials knew of the problem leading to the stoppage of the flow of water but they did not resolve to prevent it from happening,” Panelo said. MWSS administrator Velasco promised to submit their report and the solution to the problem of water shortage. Valasco admitted he and other officials for a dressing down from Duterte during their meeting in Malacañang. “We understand the President because what happened is really wrong and needs to be solved. He told us to fix this immediately,” Velasco said. “We will do everything to solve it. If I cannot do it, I will resign immediately. The President does not want people to suffer. He emphasized our job description which is to do everything right for the people,” he added. Velasco clarified that the President did not exactly ask them to resign. “The President just asked to fix then submit while he also does his own investigation. He told us that if we can’t do it, he will assign new ones to take over,” Velasco said. “We are all presidential appointees and we serve at the pleasure of the President. If you get replaced, don’t question him because once you’re in the government, the return of investment is through our services,” he added. Velasco stressed they would rather implement solutions than explain their side. “He (Duterte) said ‘if you cannot do it, tell me. I would do it myself.’ Why would we let the President do it when he already has a lot of problems. We take it upon ourselves,” he said. Apart from the removal of MWSS officials, Duterte is also considering the termination of contract of Manila Water if the problem remains unsolved. Velasco could not say how Duterte intends to terminate the contracts of water concessionaires in case they fail to solve the crisis. Velasco, however, defended the concessionaires, saying what they are doing is not easy considering that before the agreement in 1997, only 53 percent of Metro Manila was being serviced and non-revenue water was at a high of 63 percent. “If they invest, they have to recover and we wanted to give better service to the people, that is why they invest,” he said. “I think this is a very legal issue. I’m sure the President knows when he does that he will have his legal team to look into this because there are several implications. For example, how will the government return the costs they incurred over the years? From our experience, that’s the problem we are expecting,” Velasco said. “But that is the prerogative of the President. For sure, there will be studies to be done and consultations to be made,” Velasco added. “The President reiterated that he is constitutionally tasked to serve and protect the citizenry, and he will not equivocate to take swift and drastic actions to secure the people from discomfort and shield them from suffering, regardless of the dire consequences to the players of the water industry,” Panelo said. The affected areas were those being served by Manila Water in the East Zone. Maynilad, which operates the West Zone, did not have any problem but they offered to help Manila Water augment their supplies. Panelo said the Chief Executive told officials he was not going to listen to their explanation for the water shortage because these would just be plain excuses. “They simply did not do their job. ‘All they care about is get profit from the water of the people’ and to their sufferance as well,” he said. Duterte expressed displeasure why water concessionaires and government agencies were unable to address the supply shortage. “The President told them they could have simply anticipated such shortage and could have done something about it. They had to wait for him to threaten them by personally rushing to Manila from Davao to grapple with the crisis before they moved to end it,” Panelo said. Manila Water president Ferdinand dela Cruz said he has already given instructions to his team to explore ways to provide some relief in the water bills of the affected consumers during the periods of service interruption. “We will discuss this with our regulators and we will cooperate with MWSS Regulatory Office as they review our performance during this incident against our service obligations, particularly in providing 24/7 service,” Dela Cruz said. Manila Water also appealed for the development of new water sources to ensure enough raw water supply to be distributed. “Some quarters may say that we have been remiss in the past weeks, but we have not been remiss in jumping up and down to advocate for new water sources for many, many years,” Dela Cruz said. Manila Water has restored the water supply in about 95 percent of its concession area, almost two weeks after continuous interruptions, allowing customers to have longer hours of water availability daily. This is compared to the 70 percent coverage when the crisis started last March 7. By the end of the month, Manila Water is expecting to restore up to 99 percent of its serviced area. The rotational service scheme adopted is a temporary measure that aims to balance water supply distribution. In the past days, Manila Water has been making calibrations in its network distribution that resulted in the continuous improvement of water restoration. Manila Water has interrupted supply two weeks now in most of its concession area as water level in La Mesa Dam dropped to critical levels amid El Niño and increasing demand during the dry season. Supply from La Mesa Dam is Manila Water’s reserves since it has maximized allocation from Angat Dam at 1,600 million liters per day. On the other hand, the National Irrigation Administration (NIA) has been assured of irrigation water supply to rice lands in Bulacan and some parts of Pampanga until May 15. The main source of Metro Manila’s potable water comes from Angat Dam, which is also the main source for irrigation water of rice lands in Bulacan and some parts of Pampanga. “No problem with irrigation water supply until rice crops are harvested based on the water allocation provided by the National Water Resources Board,” NIA regional spokesman Eliseo Bitangcol said. As of yesterday, the water level of Angat Dam was monitored at 197.48 meters or 17.48 meters above critical level of 180 meters. Meanwhile, the Department of Agriculture’s Disaster Risk Reduction and Management Operations Center reported El Niño damage to agriculture had hit P1.3 billion. This is equivalent to an estimated volume of 78,348 metric tons and damaged agricultural areas at 70,353 hectares affecting 84,932 farmers and fisherfolk. Affected regions are the Cordilleras, Ilocos, Cagayan Valley, Central Luzon, Calabarzon, Mimaropa, Bicol, Western Visayas, Eastern Visayas, Zamboanga peninsula, Northern Mindanao, Davao, Soccsksargen and the Bangsamoro region. For rice alone, damage has reached P814 million affecting 54,924 hectares and production volume of 41,003 metric tons. For corn, damage has increased to P512.3 million affecting 15,428 hectares of land with volume loss at 37,344 metric tons.